Track / Tie Rod Ends. Bump Stop / Dust Kit. ABS / Wheel Speed Sensor. FOR CAYENNE TR-60SN 09D AUTOMATIC TRANSMISSION GEARBOX PAN SUMP ATF III H OIL. 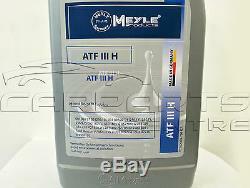 MEYLE GERMANY --- 1 x Automatic Transmission Oil Pan / Filter SEAL 6 x 1 Litres of MEYLE ATF III H KIT INCLUDES 16 MOUNTING SCREWS FITS Description Model Year Body Style kW HP cc PORSCHE - CAYENNE (955) - 3.2 10.03 - 09.07 Closed Off-Road Vehicle 184 250 3189 PORSCHE - CAYENNE (955) - 3.6 02.07 - 09.10 Closed Off-Road Vehicle 213 290 3598 PORSCHE - CAYENNE (955) - S 4.5 09.02 - 09.07 Closed Off-Road Vehicle 250 340 4511 PORSCHE - CAYENNE (955) - Turbo 09.02 - 09.07 Closed Off-Road Vehicle 331 450 4511 PORSCHE - CAYENNE (955) - Turbo 4.5 09.02 - 09.07 Closed Off-Road Vehicle 331 450 4511 PORSCHE. 6 x 1 Litres of. KIT INCLUDES 16 MOUNTING SCREWS. PORSCHE - CAYENNE (955) - 3.2. 10.03 - 09.07. PORSCHE - CAYENNE (955) - 3.6. 02.07 - 09.10. PORSCHE - CAYENNE (955) - S 4.5. 09.02 - 09.07. PORSCHE - CAYENNE (955) - Turbo. PORSCHE - CAYENNE (955) - Turbo 4.5. PORSCHE - CAYENNE (955) - Turbo S 4.5. 01.04 - 09.07. PORSCHE - CAYENNE (955) - Turbo S. 03.06 - 09.07. PORSCHE - CAYENNE (955) - S. PORSCHE - CAYENNE (955) - S 4.8. PORSCHE - CAYENNE (955) - GTS. 10.07 - 09.10. PORSCHE - CAYENNE (955) - GTS 4.8. PORSCHE - CAYENNE (955) - Turbo S 4.8. 08.08 - 09.10. PORSCHE - CAYENNE (955) - 3.0 TDI. 02.09 - 09.10. GEARBOX TRANSMISSION TYPE: TR-60SN / 09D ONLY! Your one stop quality parts shop. Huddersfield based distributor of quality branded parts for your car and light commercial vehicles at a fraction of the main agent prices. Authorised Distributors of: LUK / ELRING / MEYLE / FAG / SACHS / PIERBURG /. This is down to our offerings of quality parts and impeccable service. 9.00am - 5.00pm. PLEASE CONTACT FOR AVAILABILITY BEFORE DEPARTURE. We do ask that all payments are made immediate to avoid delays in dispatching your order. A surcharge may be applied for deliveries to these areas. These areas and the corresponding charges can be found below: The following Postcode will incur additional surcharge costs. AB31 TO AB56, ON, BT, GY, HS, IM, IV, JE, KW, PA20 TO PA78 AND ON.. Any damages must be reported to us within 24 hours for us to raise any claims with our courier. Any claims after 24 hours will be dismissed for a claim. Please be rest assured we strive in supplying branded OE quality parts which meet or exceed Industry specification. We strive to offer a 5 out of 5 star service to all customers! We aim to reply to all messages within 24 hours. FOR LEXUS IS200 GXE10 IS300 FRONT LOWER CONTROL SUSPENSION ARM REAR UPPER BUSH. FOR RENAULT CLIO 197 200 MEGANE MK3 RS SPORT TOP AND BOTTOM HUB BALL JOINT PIVOT. FOR BMW E46 2 Heavy Duty FRONT Antiroll Bar Stabiliser Drop Link Links Meyle HD. Stay up to date with our special offers. 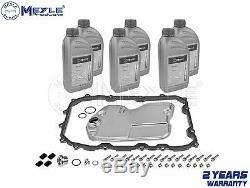 The item "FOR CAYENNE TR-60SN 09D AUTOMATIC TRANSMISSION GEARBOX PAN SUMP ATF III H OIL" is in sale since Wednesday, December 17, 2014. This item is in the category "Vehicle Parts & Accessories\Car Parts\Transmission & Drivetrain\Gearboxes & Gearbox Parts". The seller is "johnyboy-1" and is located in GB.